Institute of Business Administration, Karachi (IBA) has entered into an agreement with Cambridge English Language Assessment to provide Cambridge English “Certificate in English as a Medium of Instruction (EMI) Skills” course. 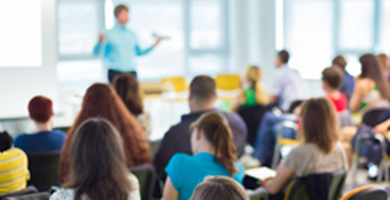 It is the approved Cambridge English Teacher Development (CETD) Course. The Certificate in EMI Skills is for university professors, lecturers, tutors and researchers whose first language is not English, but who use English to teach students, present academic papers and interact with colleagues. IBA is offering Certificate in EMI Skills blended model i.e. 40 hours of online training & approximate 27 hours of face-to-face training that will be conducted by experienced and trained instructors. increase familiarity with a range of skills for delivering instruction in English. the online course modules include video demonstrations of University of Cambridge lectures, seminars and tutorials. the Certificate in EMI Skills is at Proficient to Expert stages on the Cambridge English Teaching Framework. - can take part more confidently in professional activities in the medium of English. - Designed specifically for the higher education sector, with real-life examples from the University of Cambridge. - Helps to improve teaching quality, supporting your institution’s academic excellence objectives. - Can be used as part of a wider programme of academic staff development. - Flexible and convenient online learning – course modules can be taken separately, in any order, over a 12-month period. The Certificate in EMI Skills is a 40-hour online learning course. Each of the eight online modules has approximately 5 hours of online study materials and 3 hours of optional materials will be delivered as a combination of face-to-face and online learning. Novartis Pharma (Pakistan) Limited Managers from Quality Assurance Dept. Ending a group discussion or practical session. Focusing on the individual student. Four written assignments within each module Participants apply the language and skills they have learned to their own context and reflect on their experience. An end-of-module progress test Participants complete a multiple-choice test to check their learning. Are you a lecturer or instructor? The Certificate in EMI Skills course is offered to higher education professionals through their employer. Talk to your employer if you're interested in taking this course. City Campus Off. Garden Road, Karachi-74400.